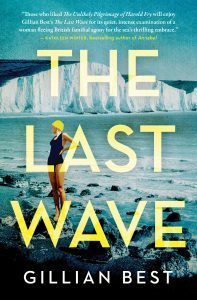 “Why am I here?” John Roberts asks Martha, his wife of over fifty years, as they stand on the rocky shore below Dover’s famous white cliffs near the end of Gillian Best’s smart and touching novel The Last Wave. “To see,” Martha answers. John doesn’t know it, and given his advancing dementia might not reliably understand or remember it if he did, but Martha has just learned that the cancer she fought off once already might be back. Martha’s response to this news is to go where she has always gone to be most herself: to the water. This time, knowing it might be the last, she strips down and swims out a ways, then turns to look back at her husband, “coming undone while picking at the fresh pink blossoms on the myrtle in the sunshine.” As the waves wash over her, so too do the memories of her two most important relationships: with John, and with the sea. No other solitude… allowed my mind to wander so freely, roaming the wilds of my fantasies and the hundreds of other lives I imagined for myself. It was something I could only ever do when properly wet. After a decade of marriage, however, Martha suddenly “felt the waves calling me back, beckoning me into the frigid depths.” She returns, dripping, from an impromptu swim, and announces to John that she is going to tackle the English Channel. From John’s perspective, her timing is terrible—she was supposed to be home preparing dinner for his boss—and her plan is preposterous. “Life isn’t about doing what you want,” he expostulates; “it’s about doing what needs to be done.” “My life depends on it,” Martha replies, and though his first reaction is a brutal rebuff, John comes to understand and support her ambition. He helps raise the funds for her first attempt and, in a pattern that is as significant metaphorically as it is literally, follows every one of her crossings (she eventually makes nine successful ones) in the pilot boat that keeps her safe and on course.